The memorial commemorates the exploration of Count Paul Strzelecki who passed through the area in 1840. 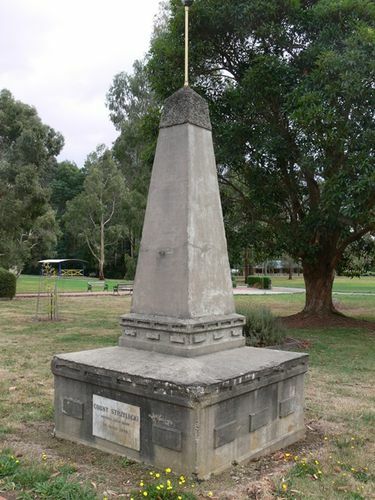 At the unveiling of the Bulla memorial for Hume and Hovell,Charles Daley the Secretary of the Victorian Historical Society suggested that the idea be extended to other explorers and a committee was formed to mark out the routes of Charles Sturt, Thomas Mitchell, Angus McMillan, and Paul de Strzelecki. Seven cairns or tablets to Strzelecki were erected. In 1839 Strzelecki set out on an expedition into the Australian Alps and explored the Snowy Mountains with James Macarthur, James Riley and two Aboriginal guides: Charlie Tarra and Jackey. In 1840 he climbed the highest peak on mainland Australia and named it Mount Kosciusko, to honour Tadeusz Kosciusko, one of the national heroes of Poland and a hero of the American Revolutionary War. From there Strzelecki made a journey through Gippsland. After passing the la Trobe River it was found necessary to abandon the horses and all the specimens that had been collected, and try to reach Western Port. For 22 days they were on the edge of starvation, and were ultimately saved by the knowledge and hunting ability of their guide Charlie, who caught native animals for them to eat. The party, practically exhausted, arrived at Western Port on 12 May 1840 and reached Melbourne on 28 May. From 1840 to 1842, based in Launceston, Tasmania (then known as Van Dieman's Land), Strzelecki explored nearly every part of the island, usually on foot with three men and two pack horses. The Lieutenant-Governor, Sir John Franklin, and his wife, Lady Jane afforded him every help in his scientific endeavours. Strzelecki left Tasmania on 29 September 1842 by steamer and arrived in Sydney on 2 October. He was collecting specimens in northern New South Wales towards the end of that year, and on 22 April 1843 he left Sydney after having travelled 11,000 kilometres (7,000 miles) through New South Wales, Victoria and Tasmania, examining the geology along the way. He went to England after visiting China, the East Indies and Egypt. In 1845 he published his Physical Description of New South Wales and Van Diemen's Land which was awarded the Gold Medal of the Royal Geographical Society in May 1846. A party, including Sir James Barrett, the under-secretary for Lands (Mr. H. O. Allan), and members of the Historical Society committee left Melbourne on Friday for Gippsland, where they will accompany the State Governor, who will unveil a series of cairns which have been erected to perpetuate the memory of the explorers Strzelecki and Angus McMillan, and to mark the routes of their chief explorations. The party will unveil several cairns each day, the itinerary to be followed being: Monday.— Omeo, Benambra, Swift's Creek, and Ensay. Tuesday.— Bruthen, Mossiface, Sarsfield, Lucknow, Calulu. Wednesday.— Sale ,Bundalaguah, Stratford, Bushy Park, Heyfield and Rosedale. Thursday.—Tom's Cap, Alberton, and Yarram. Friday.—Traralgon, Koornalla, Mirboo North and Leongatha, Saturday.—Korumburra and Corinella. Gippsland Times (Vic), 4 April 1927.